The sightseeing opportunities around Banff National Park and elsewhere in the Canadian Rockies are numerous – even if you prefer high-heels to hiking boots. 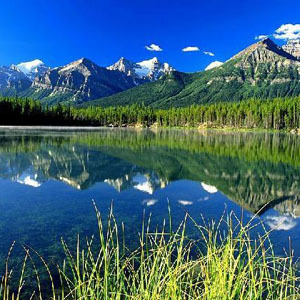 Banff, Alberta, for example, is surrounded by the aforementioned mountains of the national park. To enjoy breathtaking scenery of snow-capped peaks and forested valleys, all you have to do is open the curtains of your hotel room to see incredible views every day of the year. If you take to the road, then those snow-covered peaks of the Canadian Rockies, with their glaciers, lakes, forests and wildlife, are yours for the viewing. That’s what makes Western Canada so special; this natural beauty is accessible to everyone; all you have to do is go look. So don’t forget your camera; picturesque postcard views are around every bend. Lookouts and parking areas are located along park roads, and they provide excellent opportunities for your vacation sightseeing or holiday getaway. Starting from here in the Village of Lake Louise, you could take the Trans Canada Highway south toward Banff town for 60 kilometers, and it is a lovely drive. 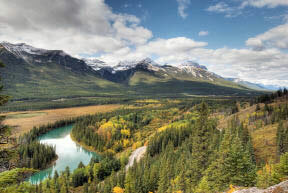 But an even better option is to take the Bow Valley Parkway, which lies east of the Bow River (the highway lies to the west of it) – this will provide you with a scenic alternative. Despite the remote wilderness locations and rugged natural beauty of the Canadian Rockies, there are actually several commercial operations in Banff National Park that make sightseeing that much easier for visitors. • Lake Minnewanka’s commercial tour boats provide access to Devil’s Gap, where vertical stone walls rise out of this still, 142-meter deep lake which lies northeast of Banff (the western end of the lake is just a few kilometers away from downtown Banff. • Banff Gondola transports visitors from downtown Banff to the summit of Sulphur Mountain, where the 360-degree panorama includes all of Banff, the Bow River, and Mount Rundle. If you’re feeling adventurous, you can hike to the top and take the gondola down – or take the gondola up and hike down. • Lake Louise Gondola takes visitors up above the lake, where they can enjoy panoramic views of the nearby mountains and valleys, or walk through flower-filled meadows. Keep your camera handy – grizzly and black bear sightings are not uncommon! Speaking of bears, wildlife viewing is of course a major pastime for Banff National Park visitors and locals alike. We’ve seen deer wandering down the street, and even the occasional black bear. It’s more common to see bears in more remote locations, but sometimes you can spot them nibbling dandelions from your car as you drive the Bow Valley Parkway, for example. Another spot right in town to see wildlife is Sulphur Mountain; hike up to the top or take the gondola and you are likely to see bighorn sheep. Of course, please respect all park rules and regulations when it comes to the wildlife. Please stay safe and keep your distance, and do not feed the animals. Like the saying says, take only pictures and leave only memories. Looking for a guided sightseeing tour? Look no further than Banff Travel. 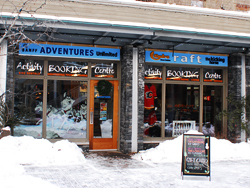 They can fix you up with all of your travel needs and all of the adventures you want to have in the Canadian Rockies. Call Toll Free (888) 659-3394 or local 403-774-7219.